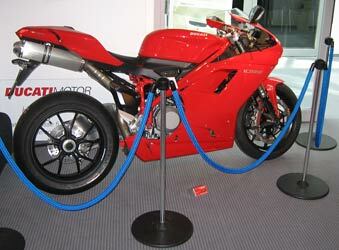 Within the Gryphon room is a new Ducati 1098 proper race motorcycle (or 'knee dragger' for those track rats like me). 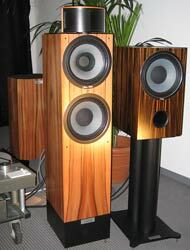 Loudspeaker manufacturer WLM used the High End Munich show to release their new Grand Viola MK. II (�12,000 on up depending on veneer). This flagship model has a Super PAC dynamic driver supertweeter, Eminence paper cone 8-inch drivers for lower frequencies. Overall frequency response is from 30Hz to 25kHz with a staggering 98dB/W/m at 8-Ohm efficiency. Could be a real winner for low-powered single-ended tube lovers such as myself. WSS had their all-new Adam Olympus Sound System (�220,000) staggering large fully active including digital crossover unit. This includes IIR and FIR filtering for time and phase alignment. 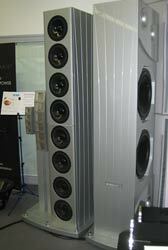 The two large 18-inch woofers are driven by 1000 watts while the eight 8-inch drivers for bass, 6 front and 6 rear midrange ribbons plus four front and four rear tweeter ribbons. The front/rear drivers can be switched for monopole (normal) or dipole. 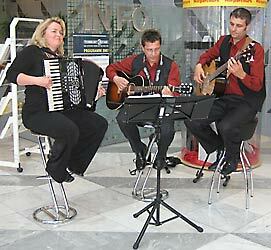 Frequency response is from 20Hz to over 50kHz. Inputs can be analog (XLR or RCA) or digital via AES/EBU or SPDIF (XLR or RCA). 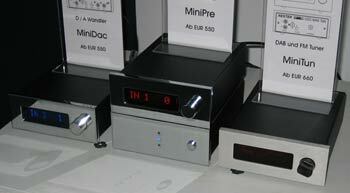 Restek had a complete 'mini me' system including the MiniDac, MiniPre (below it is the system power supply) and MiniTun (�550, �550 and �660 respectively). The preamplifier has four inputs while the DAC ha a pair of TOSlink and coax inputs. 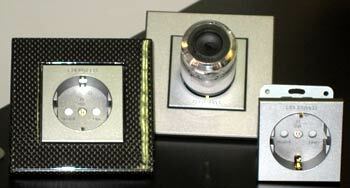 Furutech had their new European electrical outlets made with Carbon fiber and audiophile-grade gold-plated contacts. 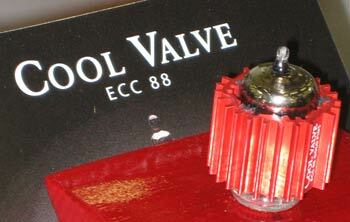 EAT's new ECC88/6DJ8/6922 is a long-life unit and includes the tube cooler/anti-resonant unit called their Cool Damper. There is a Diamond and Se4lected version (�149 and �99 each respectively). The difference between the two are the Diamond version has identical dual triode envelopes while the Selected can have upwards of 5 percent difference between each of the two triode envelopes. Other features include gold pins while the unit meets military specifications (MIL-E-1/1J168). The Cool Damper (�25) is available separately and features flexible Teflon/Carbon insert fingers of holding to the tube and allows for 18mm to 23mm size adjustment.